The Angels reinforced their bullpen with another free agent today, reaching an agreement with lefty Sean Burnett on a two-year deal with a club option, according to MLB.com's Alden Gonzalez. The deal is worth $8MM, reports Mike DiGiovanna of the L.A. Times, and includes a $4.5MM vesting option for 2015 with a $500K buyout. Burnett is represented by Jim Munsey. Burnett, 30, had been drawing strong interest as one of the best free agent lefty relievers available this offseason. 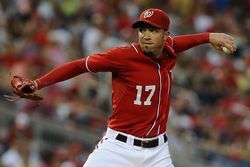 He posted a 2.38 ERA, 9.1 K/9, 1.9 BB/9, 0.64 HR/9, and 57.4% groundball rate in 56 2/3 innings for the Nationals in 2012. The Angels signed righty Ryan Madson last month, though they also subtracted Jordan Walden in the Tommy Hanson deal. Earlier today, the Cardinals reached an agreement with lefty Randy Choate on a three-year, $7.5MM deal. Last month, the Giants re-signed southpaw Jeremy Affeldt to a three-year, $18MM contract. Ken Rosenthal of FOX Sports first reported a deal was close. Photo courtesy of U.S. Presswire.